Karachi : Following last year’s exceptional response to Coca-Cola Pakistan’s fund-raising campaign supporting the Edhi Foundation, the Company has once again announced their partnership with Pakistan’s leading humanitarian and social welfare services organization for this Ramazan. The ‘Eidi for Edhi’ campaign aims to inspire the people and evoke values of generosity and kindness for an integrated fundraising drive to be implemented nationwide. Edhi Foundation from its inception has relied on public support, and traditionally donations, both zakat and non-zakat, have registered a huge increase during the holy month of Ramazan. Without the enlightened leadership of Abdul Sattar Edhi though, the Foundation had faced a decline in donations during their first Ramazan after Edhi Sahab’s demise. 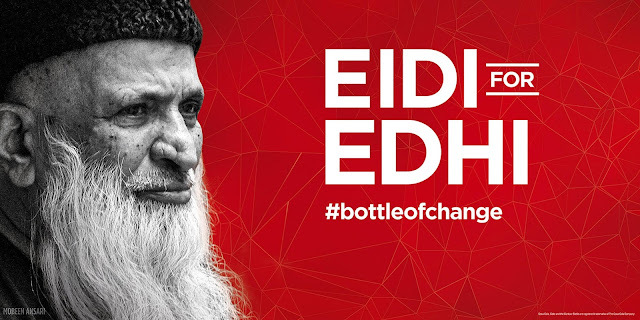 As such, Coca-Cola’s ‘Bottle of Change' campaign became a positive instrument for donations to the Edhi Foundation last year, persuading people to donate even more than before to the Foundation and thus help keep the great work of Edhi alive. The core message of the campaign this year remains the same, with the appealing slogan, ‘Eidi for Edhi’ reawakening public consciousness and willing people to come together for a great cause. Faisal Edhi, the son of late Abdul Sattar Edhi and the present head of the Foundation said, “Coca-Cola’s campaign had triggered an immense momentum last year, helping the Foundation raise considerable funds during Ramazan. The funds were used to extend the Foundation’s charitable work to even more under-privileged people, and based on the success of last year the Foundation was keen to partner with Coca-Cola again this Ramazan.” He also expressed appreciation for Coca-Cola’s several other interventions for other good causes, partnering with reputable non-profit organizations, like with The Citizens Foundation for education, the WWF-Pakistan for environmental conservation, the Kashf Foundation for women empowerment, Rotary International for eradicating polio, and the Indus Earth Trust for water related projects. It is to be noted that the Eidi for Edhi campaign has no commercial angle whatsoever, and the fundraising is in no way related to product purchase. Coca-Cola will itself match all public donations received up to a cap of Rs. 25million. Also, this year the Ramazan fundraising will build further on last year's partnership by evolving the Bottle of Change into the concept of ‘Eidi for Edhi'. This will help citizens go beyond donating in cash, and also contributingin terms of meaningful gifts that the Foundation will distribute among the less privileged in society, bringing cheer into their lives on the occasion of Eid ul Fitr. The Coca-Cola Company (NYSE: KO) is the world's largest beverage company, refreshing consumers with more than 500 sparkling and still brands. Led by Coca-Cola, one of the world's most valuable and recognizable brands, our Company's portfolio features 20 billion-dollar brands including, Diet Coke, Fanta, Sprite, Coca-Cola Zero, vitaminwater, Powerade, Minute Maid, Simply, Georgia, Dasani, FUZE TEA and Del Valle. Globally, we are the No. 1 provider of sparkling beverages, ready-to-drink coffees, and juices and juice drinks. Through the world's largest beverage distribution system, consumers in more than 200 countries enjoy our beverages at a rate of more than 1.9 billion servings a day. With an enduring commitment to building sustainable communities, our Company is focused on initiatives that reduce our environmental footprint, support active, healthy living, create a safe, inclusive work environment for our associates, and enhance the economic development of the communities where we operate. Together with our bottling partners, we rank among the world's top 10 private employers with more than 700,000 system associates. For more information, visit Coca-Cola Journey at www.coca-colacompany.com, follow us on Twitter at twitter.com/CocaColaCo,visit our blog, Coca-Cola Unbottled, atwww.coca-colablog.com or find us on LinkedIn at www.linkedin.com/company/the-coca-cola-company.